With constant competition in the industry of apparel, companies battle it out for your attention and money. One way to stand out is sales promotion and many companies big and small relay on this tactic to get you through the door. A risk in sales promotion is creating a price orientation with customers. For example, when brands position themselves as having high value products, but push an emphases on price sales promotion it can send mixed signals to what the brand is. Is it high value or cheap? Jos. A. Bank is a great example of a company that has been know to send mixed messages about their position through sales promotion. Take a closer look at the sales ad above and the commercial video below. These are common ads placed by Jos. A. Bank and the word “sale” has now been branded to their image. As mentioned earlier, creating a price orientation on a high value product creates a misinterpretation of what the product or brand represents. By offering such overwhelming sales promotions in respect to their competitors, they have caught consumers attention, but at what cost? To buy a suit at full price here would be plain stupid, and consumers are far from it. Their solution is to have such frequent sales promotions that almost every day has a sale; therefore you don’t have to wait for a great deal. The risk they face is changing their brand image and positioning themselves as cheap. When done correctly, you can balance the amount of sales promotion to entice consumer spending while retaining your brand image. The issue with Jos. A Bank is they may have crossed the line; now when people think Jos A. Bank, they think of the ads of over the top sales. Long term Jos. A. Bank has preformed well as a business, but currently there numbers have been declining. They might have found a niche market of males that but 7 suits at a time, but judging by their recent numbers they may have created a situation for themselves with one of the risks of sales promotion. This entry was posted in Student Work and tagged JoS. A. 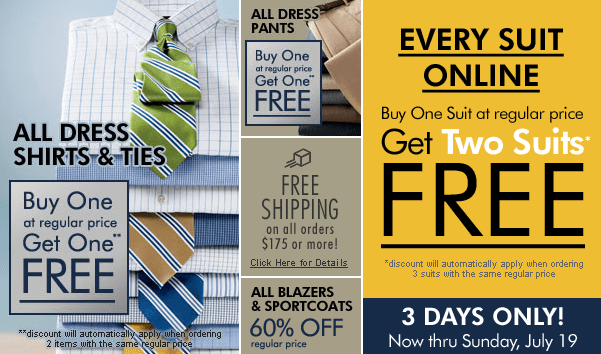 Bank Clothiers, MKTG420, Sales promotion. Bookmark the permalink. I really enjoyed your post about the risk of sales promotions. One thing I think about most when companies offer very enticing deals from a consumer stand point increases the risk that the company does not only lose out on profits but also risks making their brand equity become less valuable in the consumer’s mind. Brands some what protect themselves against this by excluding certain high end items from these sales promotions as well as making you pay full price for the highest item in a buy one get one free scenario.